From 695, Baltimore Beltway, get onto 795 (Northwest Expressway. Exit 19) Go north on 795 to Franklin Blvd. (Exit 7) which is the next exit after Owings Mills. Get off on the second Franklin Blvd. exit (west) and circle around under 795 onto Franklin blvd. Take Franklin Blvd. to the second traffic light (about 1/2 a mile). Bear right onto Church Road. Stay on Church Road for about 1 mile to a dead-end which is Berryman's Lane. At the dead-end, make a left turn onto Berryman's Lane. Stay on Berryman's Lane for about 1/2 a mile to the first left (Deer Park Road) which is just past Simonds Nursery. Make a left onto Deer Park Road. Stay on Deer Park Road for about 1/2 a mile. First right is Wards Chapel Road. Make a right turn onto Wards Chapel Road. Stay on Wards Chapel Road for about 2 miles to Deer Park Kennels which will be on the left. 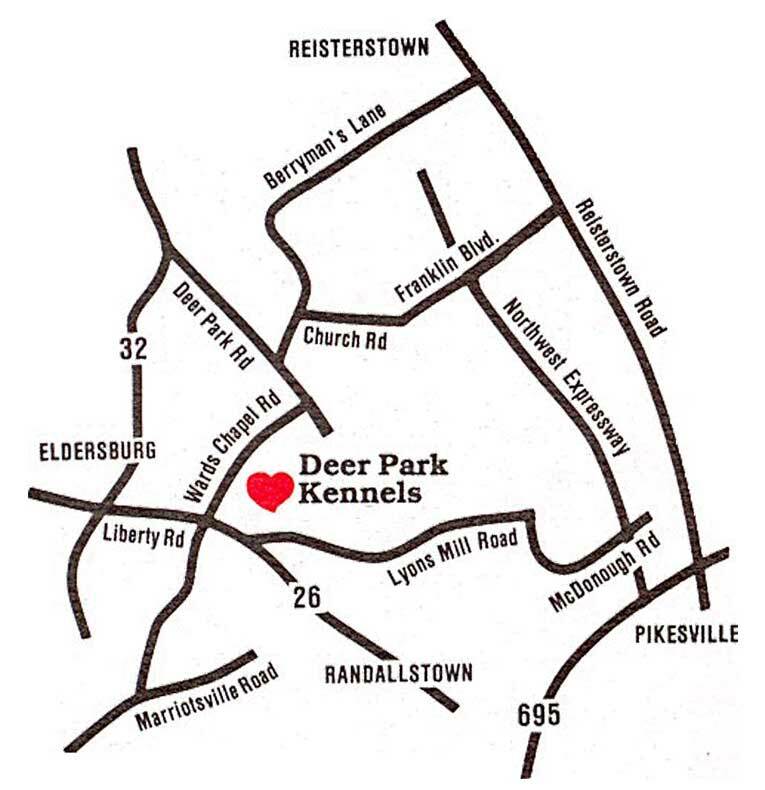 Look for a sign on the lawn which says "Deer Park Kennels". Turn up the driveway and follow signs back to the kennel office parking lot. Take route 29 north to route 70 west. Take 70 West (towards Frederick) to first exit: Marriotsville Road North, bear right onto Marriotsville for about 5 miles (past a horse farm on the left, over some railroad tracks. Past Patapsco State Park) to a gun club on the left. Just past the gun club, on the left, is Wards Chapel Road. Make a left onto Wards Chapel and come up hill for about 2 1/2 miles to route 26 (Liberty Road), cross Liberty Road, staying on Wards Chapel for 7/10ths of a mile to Deer park Kennels on the right. Parking and the office are at the very end of the driveway.